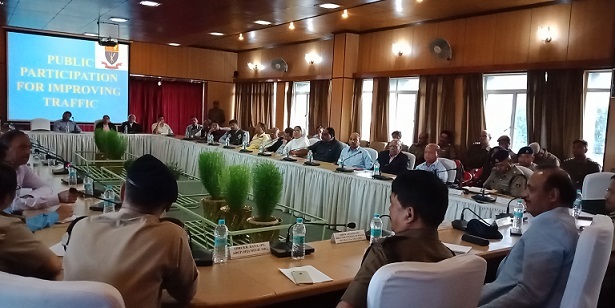 Use of school buses and public transport dominated the brainstorming session initiated by acting Meghalaya Director General of Police (DGP), Raghvendra Awasthi on Tuesday. Awasthi convened the discussion among stakeholders which include headmen of various localties, principals of educational institutions and teachers and government and police officials for finding out solution to the traffic congestion in the city. The DGP pointed out to the three Es of traffic control – Education, Engineering and Enforcement. Many speakers pointed out that the use of private cars especially dropping and fetching of school children as the main reason for the traffic jam in the city and suggested using of public transport and schools should introduce school buses for children in order to address the problem, besides widening of roads, and penalizing errant drivers who violated traffic regulations. However, among the participants many of them who represented the educational institutions did not talk much about the need to introduce school buses. But the principal of St Edmund’s College, Sylvanus Lamare said that use of school buses by children should be made compulsory to avoid traffic jam during the school hours. Rangbah Shnong (Headman) of Mission Compound, Mawkar, GS Basan said that his locality has proposed the idea of rotational parking from January next year on the roadside in the locality, since there are people who turned roadside parking as their “own parking space”. Meanwhile, Meghalaya Deputy Chief Minister in-charge PWD (Roads), Prestone Tynsong said that the Meghalaya Democratic Alliance Government wanted to complete all road projects which include construction of bypasses, expansion of existing roads, and construction of bridges and link roads as the state will host the National Games and celebrate its 50 years of statehood in 2022. Some of the major projects named by the Deputy Chief Minister include Mawlai bypass which is under construction, the proposed Shillong Western bypass from Umïam via Mawmih upto Bañiun within Seventh Mile at Upper Shillong area, construction of a road from National Highway-40 at Lad Mawklot, Upper Shillong which connect Pomlakrai and Kseh Bilat on the National Highway-44, and widening of existing road from Itshyrwat to Mawpdang which will join the Shillong bypass. Works have resumed for the construction of Mawlai bypass which costs around Rs 20 crore. Mawlai bypass starts from Mawlai Mawïong till Mawlai Mawkynroh near North Eastern Hill University. Via Mawlai bypass, vehicles will reach the city without passing through the Shillong-Guwahati national highway. Estimate has not been projected yet for the other major road projects. On construction of internal roads and bridges within the city, Tynsong said that proposals have been worked out to convert some bridges into double lane as well as build some bypasses and shortcut roads wherever possible within the city. “We wanted to convert a bridge over Umkhrah river at Mawlai Nongpdeng into double lane, building a road and along with a bridge over a stream at Umkaliar from MES to Umpling, construct an 800-metre long bypass road near military hospital, and convert the road from Mawlai Mawkynroh to Mawroh into a double lane,” he said, adding that these minor projects would together cost around Rs 20 crore.